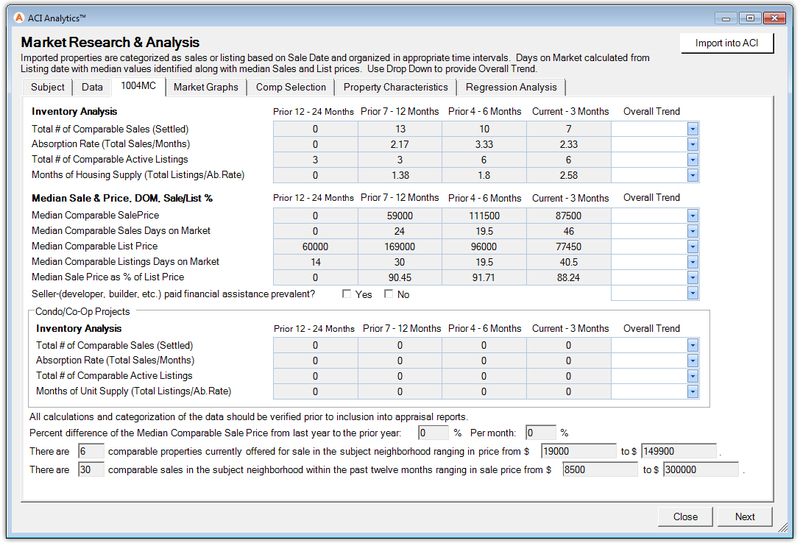 ACI Analytics is a new eService for ACI Report to help you analyze market conditions, examine property characteristics, select comparables and perform statistical analysis. The product is designed to be simple and easy to use. Analytics is structured in modules, so you have the flexibility to use only the sections that you feel comfortable with and that apply to your market. ACI Analytics uses data from a CSV file that you export from MLS. For information on exporting data from your MLS – read this help document. To get started, go to eServices > Import Analysis Data > ACI Analytics. You’ll launch into the Subject section where you can validate your subject property information. Select the Import Property Data button in the lower right corner to import the CSV you exported from MLS. Browse to the CSV and select the appropriate MLS map from the drop down menu. NOTE: If you do not see your MLS in the map dropdown menu, email your CSV to analytics@aciweb.com and we’ll map the file for you. 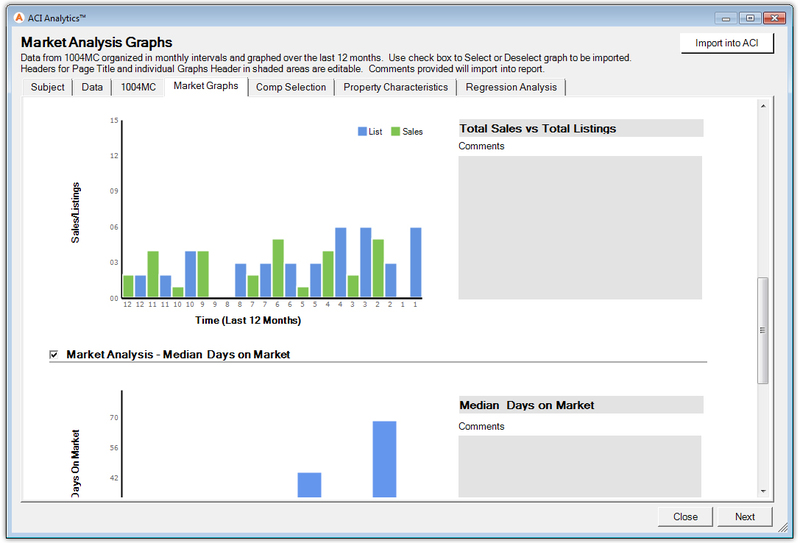 Once complete, you’ll be presented with the data table where you can exclude properties from your analysis. To exclude one or more outliers, check the Exclude check box and click Refresh. Use the Property Filter dropdown menu to view excluded properties, sales, and listings. Click in any field to make edits within the data table. You can also click on the table headers to sort by column. Select Next or click on any of the other tabs to continue. 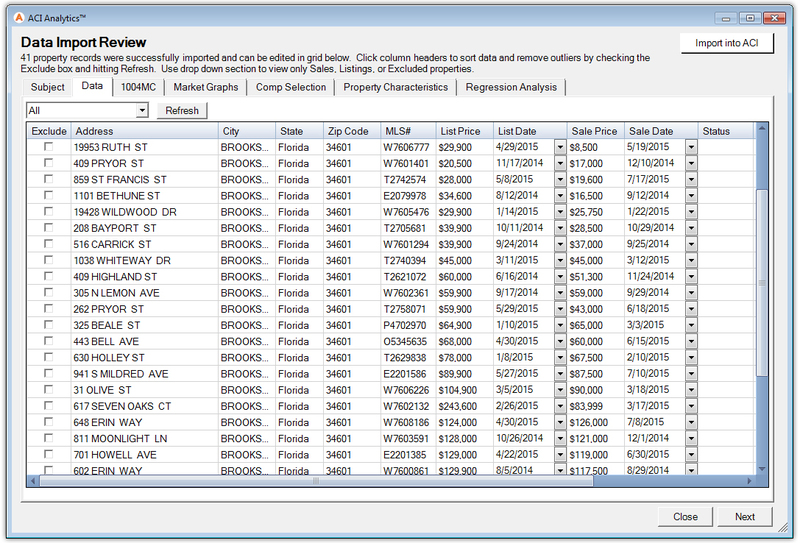 The 1004MC analysis displays the inventory totals from your MLS data throughout the last two years. Select “Increasing” or “Decreasing” from Overall Trend dropdown to complete the 1004MC section; this will fill in the appropriate fields in your report. The Market Graphs illustrate the items on the 1004MC. These graphs can be excluded by deselecting the checkbox to the upper left of the graph image. Hover over graph elements to see the figures that they represent. You also have the ability to edit the graph title and comment areas within this window. 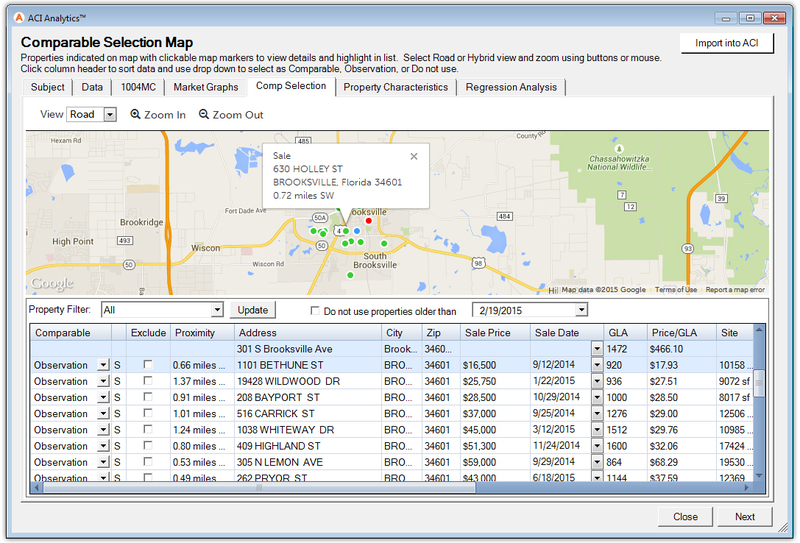 In the Comparable Selection Map, properties from your data pool are plotted on a Google Map™. Here you have the ability to pan, zoom, and change the map type as you do in our other mapping services. Hover your cursor over a map marker to display property details. You can also click to jump to the appropriate row in the data table. From the data table you can filter by sales and listings, you can also limit your observations to be the most recent by adjusting the date (by default this is set to the past 6-months). Click on a column header to sort and identify outliers. Remove an outlier by selecting “Do Not Use” from the dropdown menu to the left of the property record. From this same dropdown you can identify properties as Comparable Sales. These will map to the appropriate section in the grid. 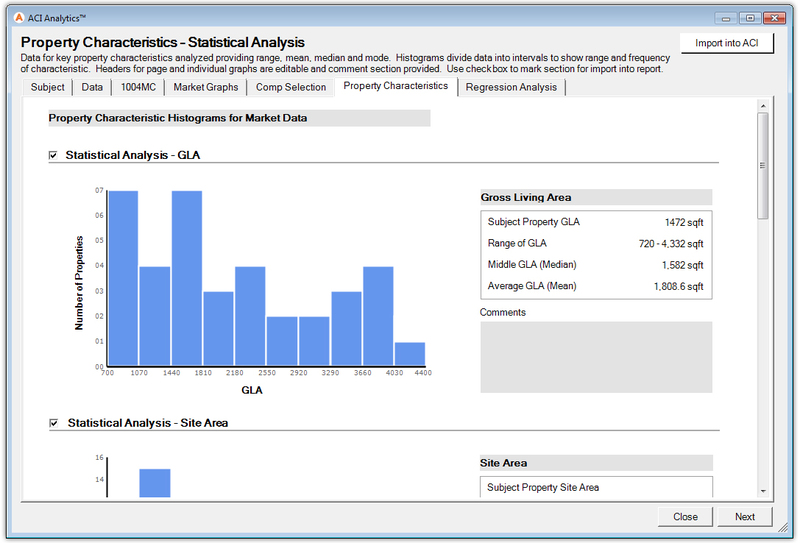 In the Property Characteristics module you’ll find histograms of each key characteristic of value. Here you have the same abilities on this graph page as the others, like deselecting the checkbox to exclude a graph, hover on a point to reveal the values, and the ability to provide additional comments. 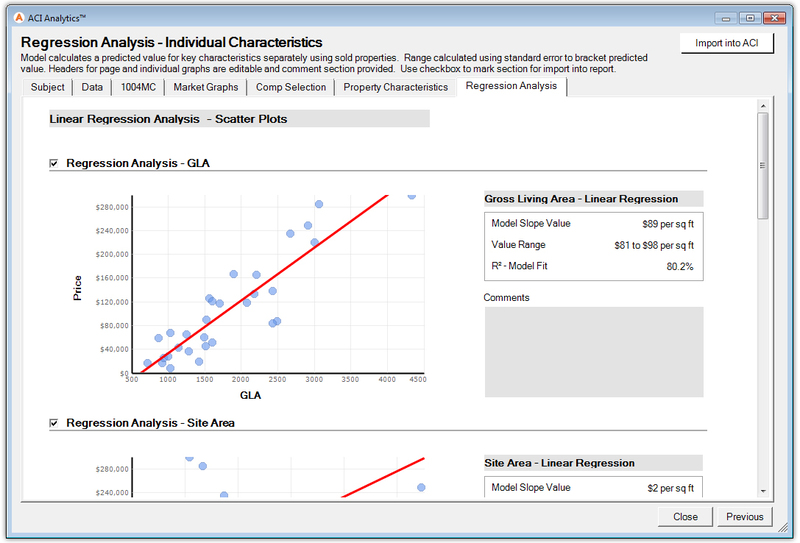 ACI Analytics provides simple linear regression where each variable is plotted separately on a scatterplot. These graphs will include all of the data from your import with the exception of what you chose to exclude from the analysis. The regression graphs display indicated model slope values and the model fit % (R2). Just like in the other graphs you can include whichever ones you’d like and provide comments on the individual components. Once complete, select the Import into ACI button in the upper right corner. You’ll then be prompted to select what modules you’d like to include in your report. Select OK and the new analytics addendum pages will be added for you on import. If you have any questions or want to share an ideas and feedback on how we can enhance or improve the product, please feel free to use the Chat panel or send us a follow up e-mail to analytics@aciweb.com.